A gale is a very strong wind. The Beaufort scale is a way to measure weather conditions, based on observations. The first level of the scale that uses the word gale is 7 beaufort (of a total of 13 steps). There are other definitions as well. The U.S. Government's National Weather Service defines a gale as 34 to 47 knots (63 km/h to 87 km/h or 39 miles per hour to 54 miles per hour) of sustained surface winds. Forecasters typically issue gale warnings when winds of this strength are expected. Other sources use minima as low as 28 knots (52 km/h) and maxima as high as 90 knots (170 km/h). The 90-knot (170 km/h) definition is very non-standard. 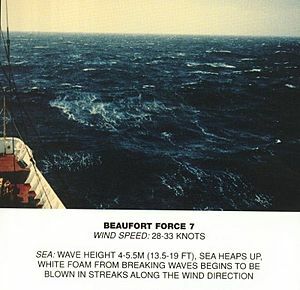 A common alternative definition of the maximum is 55 knots (102 km/h). Gale Facts for Kids. Kiddle Encyclopedia.